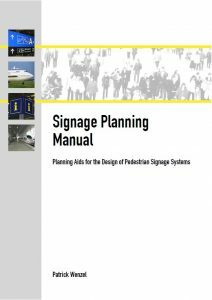 The Signage Planning Manual (Reading Sample) is designed to be a planning aid for the concept of pedestrian signage systems. Based on thorough scientific research this manual contains ready-to-use information for the building owner as well as for the signage planner. The manual does not focus on the graphical or aesthetical aspects of signage but rather on a consequent and logical overall-conception of a signage system with special attention to the underlying system of connecting paths given by the building functions and its architecture. This Signage Planning Manual summarizes renowned international regulations and planning recommendations in a comprehensive way, which makes planning of user-friendly wayfinding systems easier. The planning criteria become more objective and transparent, thus creating the basis for an unbiased assessment of the planning results in terms of logic and overall quality. The Signage Planning Manual was first published in 2004 as a paperback for 51 EUR and was also available as e-version along with discounted student-versions. Together with the original german version (Handbuch Beschilderungsplanung) more than 500 copies have been sold since. Even though almost 15 years old, the methodical approach of the manual is still valid. Now, that the print versions have been sold out, I provide the manual only in an electronic version, which can be downloaded for EUR 5,00 as a PDF-File. Please keep in mind, that this isn’t much more than a symbolic price everybody can afford. Making copies for others would not only be foul play, it is also unlawful. The transaction is processed by PayPal. Upon completion PayPal will display a link to a webpage, from where the manual can be downloaded.